The Motorola DROID RAZR MAXX has been our battery life champ for a long time, but it’s time to retire. It’s GSM-loving twin, the Motorola RAZR MAXX has the advantage that we’re testing it with Android 4.0 Ice Cream Sandwich (and not Gingerbread which the DROID version ran back then). ICS has shown a tendency to improve battery life, but the question is by how much? Well, a lot as it turns out. The call test holds a potential for a vastly different result – the DROID RAZR MAXX did its calling over a CDMA network, while the GSM RAZR MAXX relied on a 3G UMTS network. The result is almost a full hour better – the Motorola RAZR MAXX can last 21 hours and 18 minutes of talk time on a single charge. That is, if you try to use up all its energy reserves in a single call, you’ll fall asleep long before the RAZR MAXX gives up. Now we’re coming up to web browsing, where the average is about 5 hours. 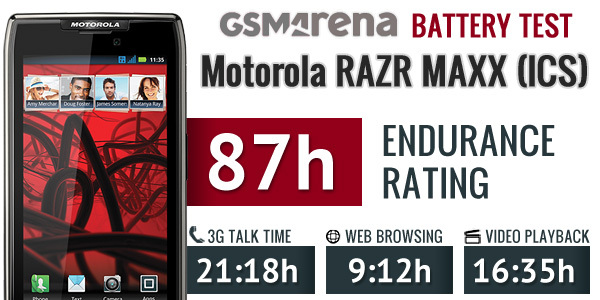 The RAZR MAXX with ICS, however, ran for 9 hours and 12 minutes – that’s nearly 2 hours more than the DROID RARZ MAXX on Gingerbread managed. It’s also three times what our lowest scoring phone here managed – the Samsung Galaxy Nexus and its modest 3:01 achievement. 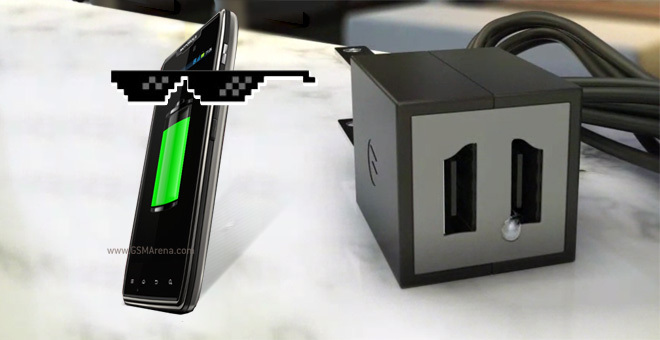 The video playback time also went up – the RAZR MAXX ran its battery from full to 10% in 16 hours and 35 minutes. That’s over 2 hours better than what the DROID RAZR MAXX did. Of all other phones we’ve tested, the Samsung Galaxy S III comes the closest – but that it still loses loses by six and a half hours. Let’s put things into perspective – say, you want to watch a full season of an hour long TV show. Without the commercials, each episode is about 42 minute on average and if we assume 24 episodes per season (most shows have less), that’s 16 hours and 48 minutes. You can watch practically an entire season of a show before you run out of juice (if you do it in offline mode). As you can expect, the final endurance rating is absolutely massive – we were stunned just how much the phone can go without needing the services of a charger. The CDMA version of the phone scored a respectable 61 hours, but the RAZR MAXX with ICS scores added up to 87 hours. This means that you’ll only need to charge your phone every three and a half days if you use it for an hour of telephony, web browsing and video playback per day. Even with heavy usage the Motorola RAZR MAXX will last two full days and have some charge left over. Actually, if you do 3 hours of calls, watch 3 hours of video and browse the web for three hours in a single day (for a total of 9 hours spent actively using the phone), there will still be some juice in the battery. Our hats go off to Motorola – the RAZR MAXX offers endurance that competing smartphones can only dream of. And the relatively thin 9mm frame and 145g of weight make this achievement all the more impressive. How long will it be before some phone dethrones the Motorola RAZR MAXX?